The DNR Wildlife Conservation Section is part of a regional project exploring migration routes and habitat use of golden eagles in the eastern U.S. Started in 2006 and first aimed at exploring threats wind turbine sites pose to golden eagles, the research (www.appalachianeagles.org) has expanded from Pennsylvania and West Virginia to as far south as Alabama as scientists learned that the eagles don’t always migrate to and from Canada along Appalachian Mountain ridges. Some fly through the Midwest, according to project leader Dr. Tricia Miller of West Virginia University. To fill in details about the pathways and the population’s distribution, scores of camera stations are being used to document golden eagles, the continent’s largest bird of prey. Researchers are also tracking eagles fitted with transmitters that post almost real-time updates to cell towers. TERN, friends group of the Wildlife Conservation Section, has provided grants to buy transmitters. In 2015, senior wildlife biologist Nathan Klaus and then-Program Manager Jim Ozier worked with Devil’s Backbone Hunting Club to create a camera “trap” site on club lands near Sprewell Bluff WMA. Klaus says the rugged mountains in and around the WMA feature endangered and other habitats of high conservation value, including grassy woodlands that offer great hunting for golden eagles. 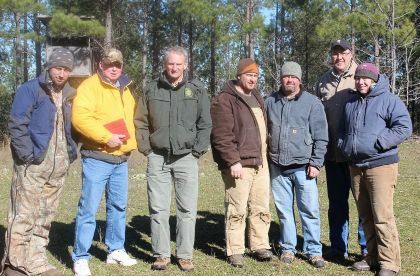 Volunteers with the club built a blind and kept a bait pile stocked with road-killed deer. 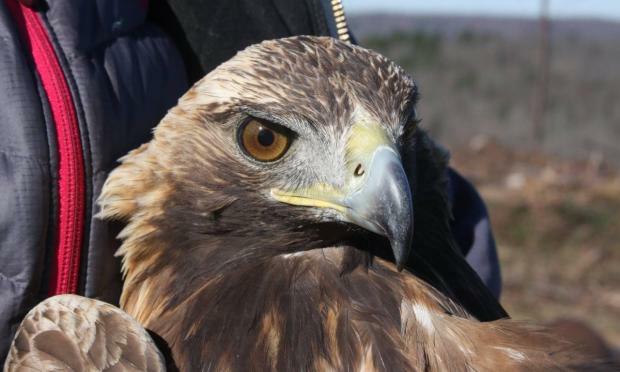 The work paid off February 15, 2015, when researchers trapped a 5-year-old golden eagle, the first one caught in Georgia for the project. Cameras also documented at least two and possibly as many as four golden eagles at the site—surprising for a state where the species is rarely seen. Club members didn’t know there were golden eagles migrating to the lease; yet, one showed two days after they set up the bait pile. Researchers tracked the Georgia-caught eagle (top photo), nicknamed Devil’s Backbone after the catch site, on migration to and from the Gulf of St. Lawrence area in Quebec, mostly along the Appalachians. In February 2016, Klaus, other DNR staff and the Devil's Backbone Hunting Club again worked with Miller to set a camera trap and catch a second golden eagle. That juvenile male, nicknamed Flint (club lands border the Flint River), is being tracked via a transmitter bought through TERN. And in February 2017, U.S. Forest Service staff, along with Miller, attached a TERN-funded transmitter to a third golden eagle. This bird was caught on the Chattahoochee National Forest near Dalton. Video of the release. By mid-February 2017, the first two eagles had migrated from the north back to the Sprewell Bluff area—Devil's Backbone returning from eastern Quebec and Flint from the shores of Lake Superior. Both have visited a camera trap at Devil's Backbone Hunting Club. The eagle trapped Feb. 22 on the Chattahoochee National Forest has stayed in northwest Georgia. While the near-real time tracking data on these eagles is not available to the public, occasional updates are posted here. Unlike bald eagles, which orient to open water and feed more on fish, golden eagles favor high-elevation forests and a terrestrial diet that includes groundhogs, rabbits, even turkeys and carrion, such as deer. The secluded habitats result in fewer sightings, even for a top predator with a wing span up to 7 feet. Golden eagles are more common west of the Mississippi River, but they’re also found in Mexico, where they’re the national bird, as well as Asia, Europe and northern Africa. Though similar in size to bald eagles, golden eagles have legs covered in feathers and the adults are almost entirely chocolate-colored. Both species are protected by state law and by the federal Bald and Golden Eagle Protection Act. Blood samples of the Georgia bird Devil's Backbone revealed the lowest lead levels Miller has seen in a golden eagle. Raptors can suffer lead poisoning from eating carrion killed by lead shot, and lead poisoning is another focus of the Appalachian eagles project. 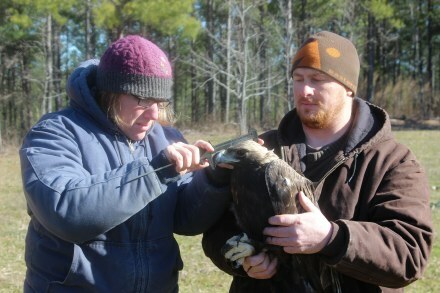 Results from the second Georgia-trapped eagle, Flint (shown below), indicated he had been exposed to lead, but below the amount at which researchers would be concerned, according to Miller. The DNR Nongame Conservation Section is part of a regional project exploring migration routes and habitat use of golden eagles in the eastern U.S. The decline and resurgence of the bald eagle in Georgia, eagle identification, facts and how to report sighting of a bald eagle nest. The manatee is listed under the federal Endangered Species Act as an endangered species and is also protected federally under the Marine Mammal Protection Act of 1972 and statewide under provisions of Georgia's Endangered Wildlife Act of 1973.